Two nights ago (on December 10th) I posted about Solar Flare and the installation process. Once again tonight I walked past the Solar Flare installation and it is now fully installed and complete. As suspected it is quite beautiful, especially in the night sky, as expected. It is not about the work itself, nor is it about the location. Rather my criticism is that the sculpture is suspended quite a bit above the roadway. I understand the rationale for why it suspended where it is and I have no issue with it. So in the grand scheme of things it is a very minor criticism. It is placed probably about five or six metres above street level so that emergency vehicles can pass below without obstacle. However, because of this, and from my observation in the few minutes I was there earlier tonight, most people who walk or drive under it will probably be completely oblivious and not even aware that it is there unless someone mentions it. However, they should be aware as there are motion sensors attached to the sculpture which facilitate movement in the work itself. Pay attention to this next time you see it. This post is yet another public service to make a reminder to visit it. 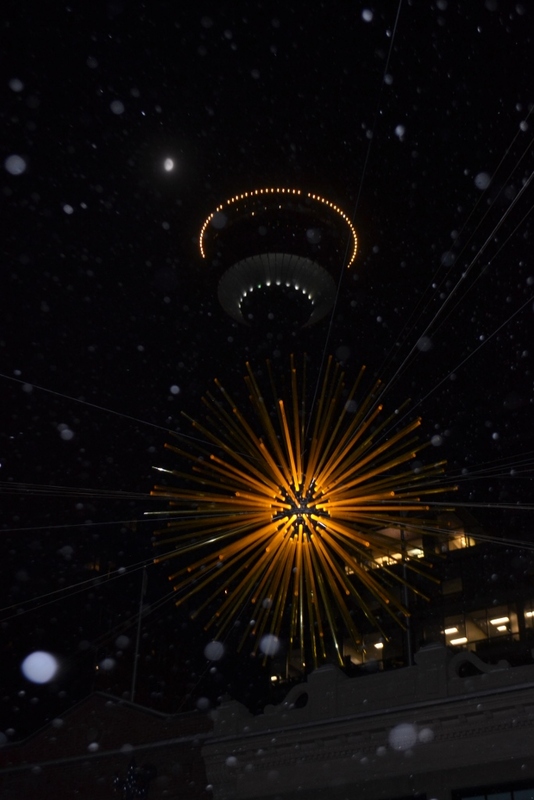 This entry was posted in Art Gallery of Calgary, Public Art, Sculpture, Solar Flare and tagged light art, Solar Flare, Stephen Avenue Mall.